Let me show you how to do a runway walk!! Some of you might remember, I took a beginner's movie star class back in 2006. (mum: just a trick class.) I learned a few things in class, did a little gig, and decided to retire and become a piggie mama!! Anyway, mum was bored (of course) tonight (in her pj's) and she decided to bring out my MARK BOX to see if I remembered anything. In Movies, they always teach the animal to go to a "mark" for positioning. So mum used a small box with me. Well, of course I still remember!!! The SuperDALE remembers EVERYTHING!! It just took me a few times to warm up, that was all! Oh, and hey, do you guys remember I did some modeling too in 2006? Well mum was at the Pet Expo last weekend and she ran into the vendor for Pet Revolution - the luxury modern designer pet bed I modeled for. Anyway, so she came home and googled "Pet Revolution" and came across their website. Do you see WHO is on their front page banner??? 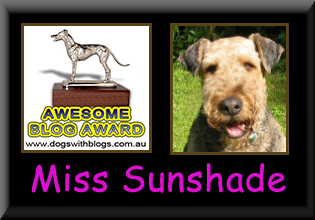 You will always and forever be a supermodel and a superstar to me, Sunshade! Doesn't the bed come in pink? It should!